Dennis Hopeless was given a momentous task when penning Avengers Arena. What he thought would be an innocent young Avengers book, rapidly became the opposite: A violent homage to Battle Royale involving kids. The cast included some favourites from the Runaways and Avengers Academy but he was met with stiff resistance with a letters page at the end of the very first issue. They were less on the inquisitive side, more on the threatening side: “Don’t you dare do something to Mettle and Hazmat.” It must have been difficult starting on the back foot, but considering the whole theme of the book is a kill or be killed, it was always going to be a challenge. Hopeless stated from the beginning that this comic was self contained and would not relate to other stories. From the creator’s perspective, it needed to be, otherwise how else would you take teen heroes away for a month and have them die. Whether the deaths were permanent was another matter but it is clear the kids in this book are not featuring in any other comic in current continuity. As comic book readers we become very attached to our characters, and they sometimes become the sole reason for buying a book. It is very upsetting when they die, but they rarely stay dead for very long which often provides some solace. However the characters in Avengers Arena are new, relatively unknown or part of previous super groups, with the most recognisable being X-23. This lends easily to the deaths of the non nostalgia characters, but therein lies the problem. Killing a character needs to mean something otherwise it is unnecessary and when the concept is based upon murder, then it requires significance and quick. 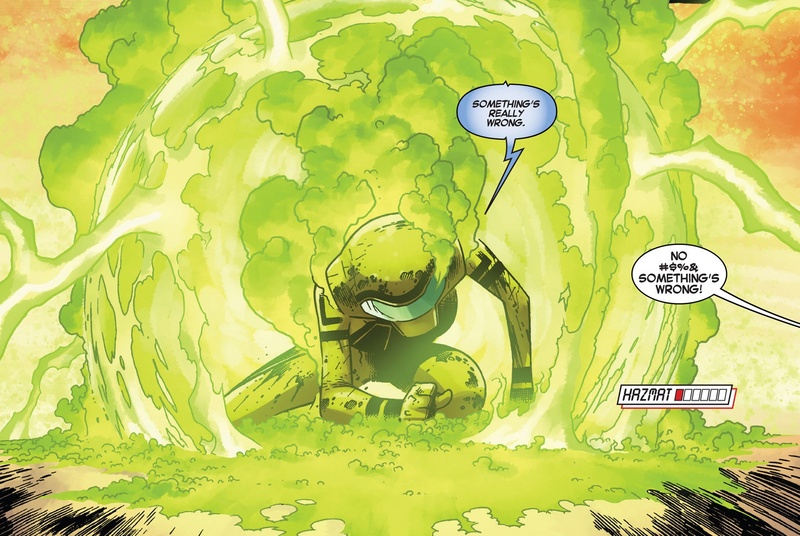 This is the sole reason why Mettle died in the very first issue, his relationship was well established with Hazmat and he was a martyr for love. Dennis then went to work. The following issues were very character exposition heavy and some issues were solely dedicated to delivering background for a single teenager. Quite often it was done very well, such as issue two where we had a delicate balance between Death Locket’s origin and her interactions with her fellow competitors. It also set up the beginning of a relationship with Apex that remained essential til the final issue. Issue five and six also come to mind as they sets up the frailty of Kid Briton’s bravado leading to a climactic ending completely altering the friendship between Nara, Anachronism and Cullen. At times the origins were rather average and very little happened on Murder World as it was too relationship heavy. But what did not happen was a lot of unnecessary deaths. As much as the premise sets out, there was never going to be a continual string of killings. This is still a comic that is out there to provide a decent story. You may rue the deaths of Mettle, Briton and Juston but they happened for a purposeful narrative and Hopeless was not going to be killing unnecessarily. There were a couple of issues which detracted from the excitement of Murder World, and provided light refreshment. These included the origin of Arcade and a hunt for missing children by Pym and Tigra, providing some perspective on how Murder World fits into the rest of the Marvel Universe. These issues see fill in artists Moline and Vitti play their part. For the most Kev Walker provides the majority of the art, and on the whole, does it very well. 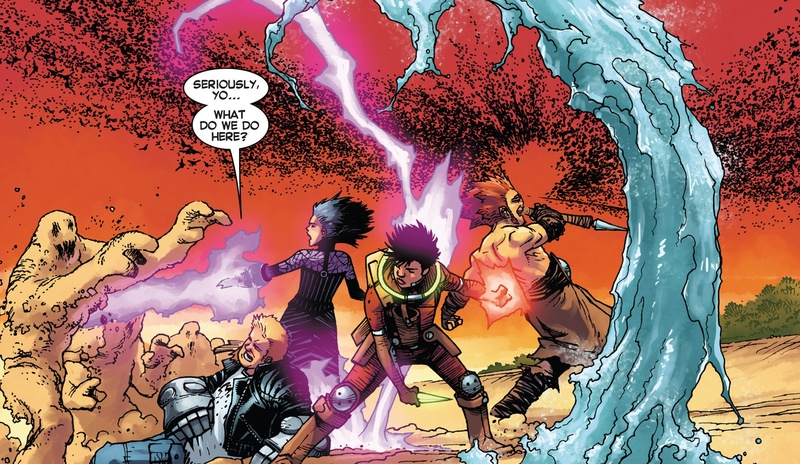 There are two key aspects of his pencilling which fit perfectly with the themes of Avengers Arena: Teenage angst and powerful battles. 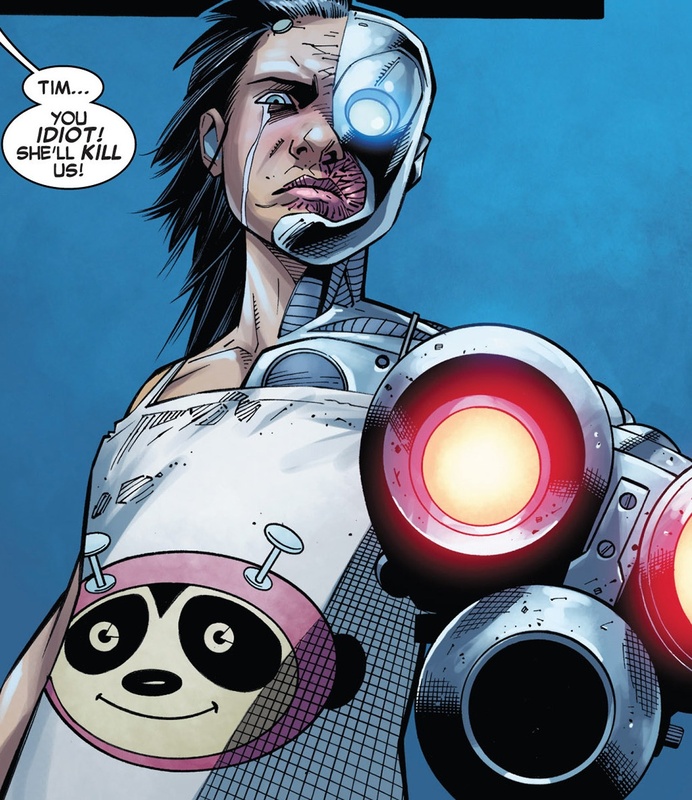 Throughout the book we can see the despair of Death Locket, the cunning of Apex, the doubt of Anachronism, the ferocity of X-23 and the resoluteness of Cammi. These students wear their heart on their sleeve and throughout their background exposition, we feel with them. Their faces are drawn with thin but precise lines adeptly conveying emotion, as their relationships are twisted and strained. The fight sequences are fantastic and there is a varied amount of power on display. Whether there are dinosaurs, giant sea creatures, vicious weapons or the lethal radiation from Hazmat, they are all depicted empathically. The explosions are huge, juxtaposing with the crucial impact of a single punch. Each hero has their moment and the balance is wonderful. Mention must be made of Beaulieu’s palette, which is so bright and colourful. A lot of brutal action takes place on a sunny beach and this is not forgotten when displaying the dark confrontations at play. There is a huge amount of colour on the outfits of the participants but also their powers, especially Nico’s magical abilities. The brilliance of the book lies in bringing emotional significance to many of the fights, in a well-lit and bright environment. Both rarely feature in the modern age of fight ridden mainstream comics. Dennis Hopeless had to produce eighteen issues in twelve months, which is a tough schedule to maintain. Whilst reading this book issue by issue, I felt that it was quite slow and a short narrative. In rereading it I found myself having been a little harsh as there was a necessity to develop the characters prior to anything happening to them. It is an arduous task to create relationships and then destroy them very quickly. Maybe I felt the lust for blood given the premise, but in hindsight it was written exceptionally well. The book may also be better read as a trade paperback compared to single issues. For all those anxious readers scared of losing their loved ones, we were treated to an excellent story of teenage romance and loss. Dennis had succeeded in quickly bring adoration to some of the cast before having them battle in fatal circumstances. This skill is rarely seen in the popular comics these days, and is testament to the creativity of the writer. I think we all realised quite quickly into the book, that the majority of the cast would be alive at the end, especially as they will form part of a new book called Avengers Undercover. However Hopeless has created his team and a set of characters in his image. He has carried out in depth research and was just to his love of the Runaways. At its finale I hope that more people will go back and read this remarkable and unique teen superhero book as it truly sits alone on the shelves. In fact calling it a teen book fails to do it justice, it is an extraordinary tale of courageous young adults. Next PostThe Theatre List 4/12 – Happy Kitty makes an appearance!